I’m starting up a new series here at the Bioscope. It is going to document the ways in which the early motion picture recorded and influenced the lives of some significant individuals. Public lives from 1896 onwards started to be different to a significant degree because they began to be led in front of motion picture cameras, which could record them in reality or reconstitute them dramatically as entertainment. Each post in the series will investigate an individual of significance to social, cultural or political history and try to see them particularly in the light of the cinema. Each post will include a filmography including both non-fiction and fiction films. I don’t know whether any of the subjects will be actors or filmmakers – maybe so. But the series starts with a French soldier, victim of one of the most notorious cases of miscarriage of justice in history, Alfred Dreyfus. 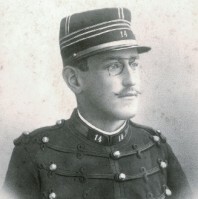 Alfred Dreyfus (1859-1935), a Jewish French officer, was arrested in October 1894 on suspicion of spying for Germany. A military court suspended him from the Army and on highly dubious evidence he was sentenced to life imprisonment on Devil’s Island. In 1896 one Colonel Picquart found documents which seemed to offer convincing evidence of Dreyfus’ innocence and it became apparent that the guilty party was another French officer, Ferdinand Walsin Esterhazy. The military authorities under General Auguste Mercier ordered the matter hushed up, and Picquart was transfered to Tunis. But Dreyfus’ family continued to plead his cause, and a campaign led by the author Emile Zola (who wrote an open letter to the French president Émile Loubet famously entitled ‘J’accuse’) resulted in a fresh trial in 1899, which became a mockery through the Army’s refusal to admit that it could be in the wrong and the general anti-Jewish hysteria that abounded. Dreyfus was found guilty again (to the shock and disgust of world opinion), but President Loubet swiftly pardoned him. The case was reviewed in 1906 and Dreyfus found innocent. The whole affair saw France bitterly divided between Dreyfusards (generally liberals, Socialists, anti-clericals and intellectuals) and anti-Dreyfusards (generally Roman Catholics, monarchists, anti-Semites and nationalists). It became the major political crisis of the Third Republic, and seriously weakened the world view of France as a champion of liberal values. L’affaire Dreyfus: L’île du diable. 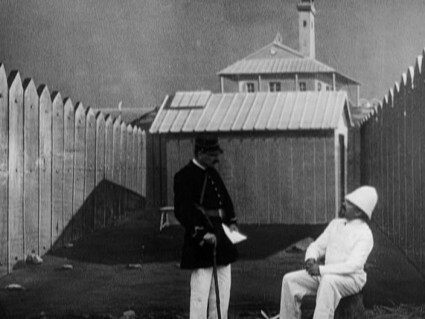 April 1895 – Dreyfus (seated) within the palisade on Devil’s Island, where a guard brings him a letter from his wife but is forbidden to speak to him. Dreyfus was imprisoned on the island for over four years. The Dreyfus affair was debated across the world. 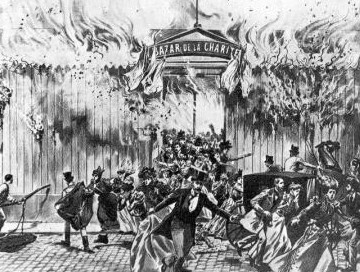 It filled the newspapers, and the second trial at Rennes in 1899 witnessed a media frenzy of a kind we are all too familiar with today. Eager to participate in that frenzy and take advantage of one of the first news stories of worldwide interest to come into its view was the motion picture camera. Films were made of the Dreyfus affair because they were excellent business, but also – in one significant case – because they enabled the filmmaker to express his dedication to the Dreyfus cause. The motion picture industry responded with newsfilm, dramatic reconstructions and sketches, so that the Affair served as a demonstration of everything that the young medium could do to capture the semblance of reality. L’affaire Dreyfus: Mise aux fers de Dreyfus. 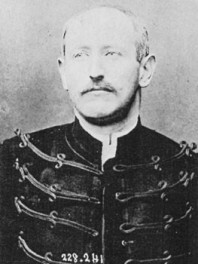 6 September 1896 – Dreyfus is placed in irons inside his cell on Devil’s Island. He was shackled to his bed for a period between September-October 1896 after a false report of an escape attempt. Four companies produced films on the Affair while it was ongoing: Star-Film (i.e. Georges Méliès), Pathé Frères, the British Mutoscope and Biograph Company and its sister company the Biograph and Mutoscope Company for France. There’s a lot to cover so the latter three will be covered in a second post, with a full filmography in a third post. Here we will tackle the contribution by Georges Méliès. George Méliès is said to have picked up his strong Dreyfusard feelings from discussions with his cousin Adolphe. It is heartening to know that France’s great creative filmmaker in the early years of cinema chose the right side. He set about making his Dreyfus films with an eye to commercial opportunity but also as a means to express his personal sympathies – probably the first time that film had ever been used in this way. His approach was radical – he would make a multi-part news narrative, tracing the Dreyfus story from his original imprisonment in 1894 to the second trial in 1899. At a time when films were almost entirely single-shot narratives of less than a minute in length, Méliès produced a 15-minute, eleven-part chronological series of documentary fidelity and great cinematic invention (strictly speaking it was twelve parts, as one scene covers two catalogue numbers in the Star-Film catalogue). Filming took place August-September 1899, while the trial was taking place, at his studios at Montreuil, Paris. L’affaire Dreyfus: Suicide du Colonel Henry. 31 August 1898 – Colonel Joseph Henry, who discovered the ‘bordereau’ that incriminated Dreyfus but who later forged documents in an attempt to compromise the Dreyfus-supporting Colonel Picquard, cuts his throat with a razor while in prison in Paris. Méliès did not consider filming actuality – he got nearer to his idea of the truth through dramatic recreation. He took great care to replicate locations, using newspaper illustrations and photographs as reference, and employing performers who looked like the leading players in the real-life drama. An unnamed blacksmith played Dreyfus because of a physical similarity, while Méliès himself played Dreyfus’ bearded lawyer, Fernand Labori. The choice of tableaux indicate Méliès’s sympathies while showing both his commercial sense and artistic imagination. The series (nine parts of the original eleven survive today at the BFI National Archive and are illustrated throughout this post) starts with Dreyfus being accused of writing the Bordereau, the notorious document that betrayed French military secrets to the Germans. 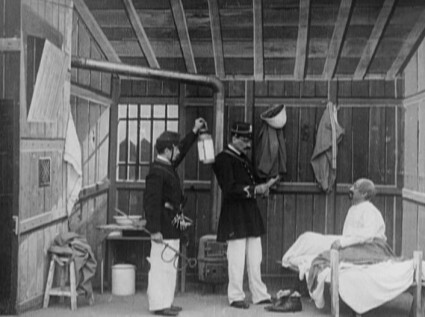 The scene in which Dreyfus was dishonourably discharged from the French army by having his sword symbolically broken is lost, so next comes Dreyfus imprisoned on Devil’s Island, followed by a scene in his cell in which he is placed in leg-irons, punishment for a supposed escape attempt. Méliès’s Dreyfusard sympathies are already made clear. The scene then switches to France to show Colonel Henry in prison, the man whose zealous loyalty led him to forge documents intended to compromise Dreyfus supporter Colonel Picquard, spectacularly cutting his throat with a razor blade. 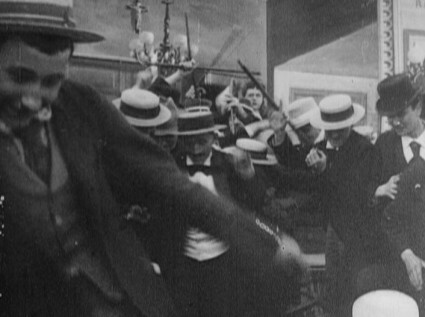 It’s the point where Méliès meets Tarantino; probably the first blood to be seen shed in cinema history. L’affaire Dreyfus: Débarquement à Quiberon. 30 June 1899 – Dreyfus (the figure in civilian clothes in the centre) returns to France at Quiberon (where a storm rages) to face his second trial. With the next scene the news realism takes over. Dreyfus is shown returning to France at the port of Quiberon, at night, in the middle of a storm. Lightning flashes, the performers are soaked in water, sailors on the boat bob up and down on the waters – it is as far as possible the scene as it had occured only a few weeks before Méliès started filming. 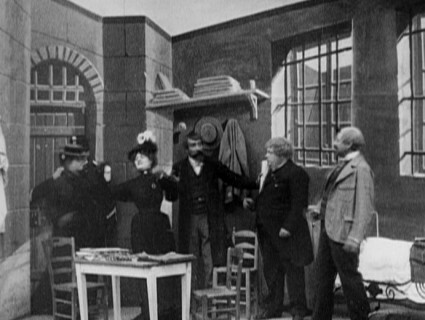 We then see Dreyfus in jail, where he converses with his lawyers (including Méliès as Labori, giving himself the heroic defender role – was this series the first set of films in which named living people were portrayed by actors?) before meeting with his wife Lucie in a calculatedly pathetic scene. L’affaire Dreyfus: Entrevue de Dreyfus et de sa femme à Rennes. 1 July 1899 – Dreyfus (furthest right) in prison at Rennes meets his wife Lucie for the first time in four years. Georges Méliès, playing the lawyer Labori, is the figure in the centre, with another Dreyfus lawyer, Edgar Demange, portrayed to the right. 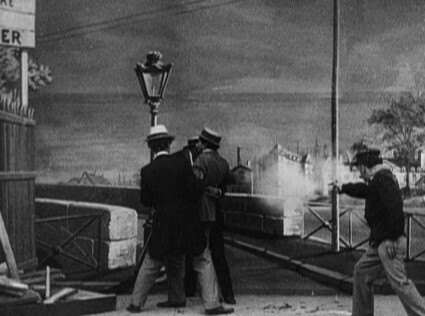 Next follows what was an assassination attempt on Labori, Méliès going to the trouble of replicating the locale, next to a bridge crossing the river Vilaine at Rennes. Labori survived a shot in the back and is seen in the next scene in which Dreyfusard and anti-Dreyfusard journalists come to blows. The scene appears symbolic, but reflects actual uproar that occurred at the court-house in Rennes on 14 August 1899 when news of the attack on Labori was reported, with a confrontation occuring between anti-Dreyfusard Arthur Myer of the Gaulois and Dreyfusard ‘Séverine’ (Caroline Rémy) of the Fonde, as the Star-Film catalogue relates. A New York Times report makes clear the connection between the two incidents. For film form enthusiasts the scene is most remarkable for the way the journalists all run at and past the camera, breaking the cinema screen’s fourth wall in revolutionary style. However there is some dramatic licence, because the injured Labori did not return to the trial for a week after the shooting. L’affaire Dreyfus: Attentat contre M. Labori. 14 August 1899 – In the company of Colonel Picquart and M. Gast, Mayor of Rennes, Dreyfus’s lawyer Labori is shot in the back by a would-be assassin beside the river Vilaine at Rennes. L’affaire Dreyfus: Bagarre entre journalistes. 14 August 1899 – rival news reporters fight one another during the court martial proceedings upon hearing the news of the attempted assassination of Labori. 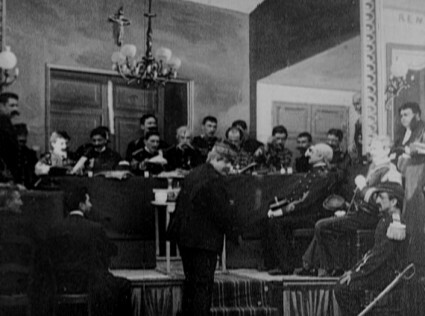 A scene in the Lycée at Rennes, showing the military court-martial of Captain Dreyfus. The only occupants of the room at this time are Maître Demange and secretary. Other advocates and the stenographers now begin to arrive and the sergeant is seen announcing the arrival of Colonel Jouaust and other officers comprising the seven judges of the court-martial. The five duty judges are also seen in the background. On the left of the picture are seen Commander Cordier and Adjutant Coupois, with their stenographers and gendarmes. On the right are seen Maître Demange, Labori, and their secretaries. Colonel Jouaust orders the Sergeant of the Police to bring in Dreyfus. Dreyfus enters, saluting the court, followed by the Captain of the Gendarmerie, who is constantly with him. They take their appointed seats in front of the judges. 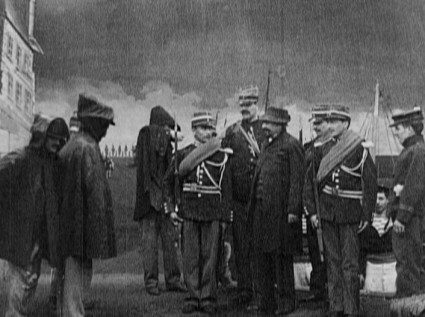 Colonel Jouaust puts several questions to Dreyfus, to which he replies in a standing position. He then asks Adjutant Coupois to call the first witness, and General Mercier arrives. He states that his deposition is a lengthy one, and requests a chair, which is passed to him by a gendarme. In a sitting position he proceeds with his deposition. Animated discussion and cross-questioning is exchanged between Colonel Jouaust, General Mercier, and Maître Demange. Captain Dreyfus much excited gets up and vigorously protests against these proceedings. This scene, which is a most faithful portrayal of this proceeding, shows the absolute portraits of over thirty of the principal personages in this famous trial. L’affaire Dreyfus: Le conseil de guerre en séance à Rennes. 12 August 1899 – The court room at Rennes, with the lead prosecution witness General Mercier (centre) making a showy entrance. Dreyfus, dressed in military uniform, is seated on the raised dais to the right. L’affaire Dreyfus concluded with a now-lost scene showing Dreyfus being led away to prison once more. 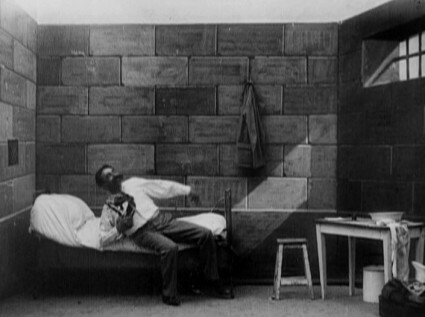 The set of films was produced with the intention of capturing audience attention immediately following the trial (which ended on 9 September 1899). The films could be bought as a complete set (lasting some 15 minutes) or individually, according to taste and pocket. Méliès’ granddaughter much later wrote that there were pitched battles in the theatres where the films were shown. Police had to separate Dreyfusards from anti-Dreyfusards, which supposedly led to the film being banned by the French government and that consequently no film was allowed to be shown about the Dreyfus affair until 1930. However, there is no concrete documentary evidence that I’m aware of for the film being banned, or even for the scuffles in theatres, and in any case the French ban on accounts of the Dreyfus affair was not made until 1915 (so, for example, Pathé made a film about Dreyfus in 1908). However, there must have been great uncertainty among some exhibitors about showing the film, as film historian Stephen Bottomore suggests that some British theatres chose not to screen the films because of the unseemly passions they might arouse, so one can hardly expect less of a reaction that this in France. Nevertheless the films were never removed from the Star-Film catalogue, and by remaining on sale one has to deduce that they were never banned, not in France or anywhere else. In truth we don’t know much about the reception of Méliès’ films. We have commentaries, and we have concerns raised in some quarters about the dramatisation of actuality. “Where is this new kind of photo-faking to stop?” asked Photographic News, wringing its hands in mock despair. What we can gather from watching what survives today is that the news story gave the filmmaker the opportunity to produce a documentary (there can be no other word for it) using every valid filmic device at his disposal while expressing through the mise-en-scène his sympathy for Dreyfus the victim. Unsurprisingly the films do not give us much of an idea of Dreyfus the man, but it is remarkable that they give us anything of him at all. Throughout the affair, and in all acounts that were made of it, Alfred Dreyfus was a cipher, a figure upon who one could unload one’s prejudices or sympathies. Dreyfus (shown left, in 1895) was not an unremarkable man. He had had a notable military career, and was recognised for his keen intelligence. He seems to have been something of an unpopular figure, however, standing out from his fellow officers by being neither one of the humbler sort (he was wealthier than most of them) nor an aristocrat. A perceived aloofness stood against him. During both trials he refused to play the pity card and put his faith in reason – a stubborn policy when surrounded by such rabid anti-Semitism and blind refusal from many to accept that the French military could do any wrong. But there was nobility in such a stance, and Méliès’ Dreyfus does at least give us some sense of his principled forebearance, and this at a time when films had not yet advanced to giving much sense of individual character in dramatic representations. Among the many ‘firsts’ that can be ascribed to L’affaire Dreyfus is surely the first human portrayal of someone on screen. The Méliès L’affaire Dreyfus is available to view online on the Europa Film Treasures site and as part of the 5-DVD set issued by Flicker Alley, Georges Méliès: First Wizard of Cinema (1896-1913) (also the source of the frame grabs used here). For a filmic analysis, see Michael Brooke’s Georges Méliès blog. For extensive background information on the Dreyfus affair, the personalities and the issues involved, see the excellent Dreyfus Rehabiliated website. Unfortunately its section on the films of the affair is muddled. For a concise and informative book acount, see Eric Cahm, The Dreyfus Affair in French Society and Politics. The essential account of the Dreyfus Affair and early film is Stephen Bottomore’s essay ‘Dreyfus and Documentary’, Sight and Sound, Autumn 1984, to which these posts are much indebted. Part two will explore the dramatic records made by Pathé, at the time of the trial and later, and the extraordinary actuality films of the trial made by Biograph. Part three will be a Dreyfus filmography. That was a good essay. Every time I read about the Dreyfus affair, I get angry, especially when they sent him back to Devil’s Island. You said it’s fortunate that Melies took the right side — it seems so hard to imagine someone taking the other side, but many people, in France and elsewhere. You make many good points about this probably being the first movie with actors portraying named living people. I’m looking forward to part 2. Re-reading the piece, it goes on a lot about the particularities of film and could have said a bit more about the issues involved. It was a terrible instance of where deeply ingrained racial prejudice and obsessive nationalism trampled over the due process of law. It was patently obvious that Dreyfus was innocent at the second trial, but the court still felt it had to pronounce him guilty because its idea of nation and army was more important. It shows how weak the law can be in the face of prejudice. Bravo Georges Méliès for showing common human decency. He wasn’t sent back to Devil’s Island, by the way. When he was found guilty he was sentenced to ten years in prison but the presidential pardon was made twelve days later. But it took until 1903 until a case was built that comprehensively proved his innocence and 1906 until a court pronounced him formally innocent.